We are reaching out to our community to help us raise funds to support programs and services helping children, adults, and families impacted by or at risk for developing a drug abuse problem. One of our current areas of focus relates to the opioid epidemic. We are working to help safeguard our youth, young adults, and adults from the lifelong consequences of opioid abuse through education efforts, outreach, treatment and recovery support services. This epidemic is impacting our communities more than we realize as it is often underreported and unnoticed until severe consequences are experienced. Please help us continue our efforts by supporting our annual fundraiser. As a non-profit, we depend on the generosity of our community to strengthen the work we do. Through our work, Behavioral Health Solutions focuses on implementing evidence-based approaches appropriate for the populations we serve for effective long-term results. Thanks to our collaborative partners and supporters, Behavioral Health Solutions has worked to identify and fill gaps in services and support since 1991. Originally serving three counties, today we serve nineteen counties in South Texas with services provided in urban and rural areas at schools, community centers, housing authorities, social service agencies, and numerous other settings. On behalf of our Board of Directors, team members, and the individuals we are fortunate to serve, I wish to invite you to our “Noche Inolvidable: Casino Disco Night” event. The night will be filled with live entertainment, casino games, dinner, and prizes. 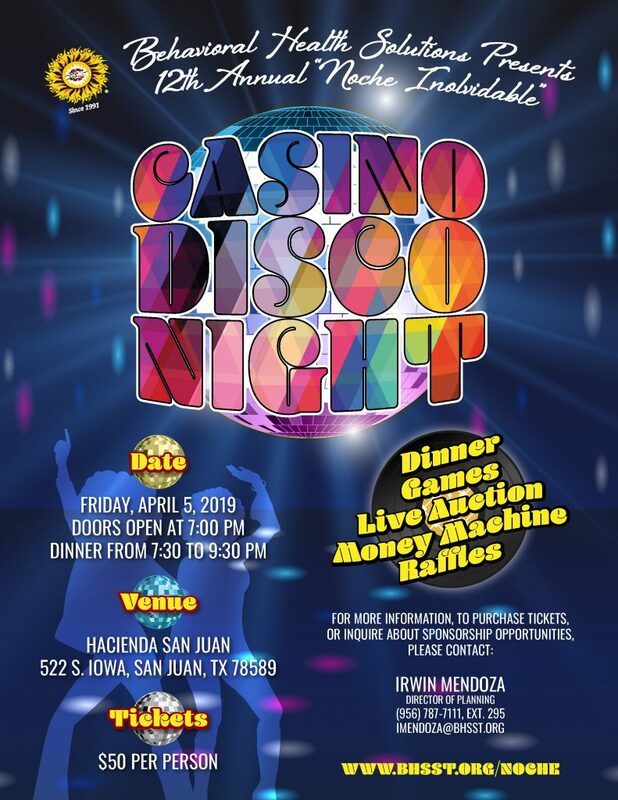 Our Casino Disco Night event will be held on Friday, April 5, 2019 at “Hacienda San Juan” located at 522 S Iowa in San Juan, with doors opening at 7:00 pm. All proceeds for this event will help support and maintain services and programs offered by Behavioral Health Solutions. Click here to download the 2019 BHS Noche Inolvidable fundraiser packet.